These fritters are loaded with different types of Dals/legumes. The coconut bits, curry leaves are not to be skipped. Be as generous as possible. I made these Mixed Dal Fritters for the Ugadi Festival Thali this year. I first tasted these fritters at a friend's place. When I asked her for the recipe she reeled out the ingredients and I didn't note it. But I distinctly remember the flavor of garlic and curry leaves. So when I was planning the menu for Ugadi, I thought of those fritters and searched online for any variations. Since it was a festival thali, I needed it to be no onion and no garlic. After looking at the various versions, I tweaked the ingredients to arrive at the recipe according to our taste buds. Wash and soak all the dals and idli rava/parboiled rice separately for 2 hours. [I used Idli Rava]. Grind into a coarse batter. Mix in idli rava (if using) salt, ginger-green chili paste, curry leaves, coriander leaves and coconut bits. The consistency of the batter should be thicker than pourable consistency. Heat oil in a wok. When the oil is hot enough, scoop the batter with a spoon and gently drop into hot oil. After the undersides are brown, flip then and allow them to evenly brown. Remove onto paper towels to drain the excess oil. Serve warm with any chutney of your choice. The fritters look so crunchy! I have never added rice while makes the fritters. And yes, coconut bits do lend a nice crunchy to them, definitely not to be skipped! Adding coconut brings a nice nuttiness and crunchiness to this ultimate fritters, and this is definitely my kind of fritters Harini, love to munch some. That is a delicious platter full of fritters with dal. We do get these dal fritters here, but as you mentioned it is so full of garlic flavour. i am sure this no garlic version is equally good.. I can finish the whole plate in no time.. So crunchy and yummy.. The coconut bites in them add an extra taste to the fritters..
wow such an interesting combination of legumes to make these crispy and crunchy looking fritters, fritters with no onion and no garlic is by itself a wonderful thought Harini !! This is so similar to a Tamilnadu special vada .. Such a delicious platter on the background!! Proteinicious and filling too ! We make something similar called kunukku and another variant with lobia(black eyed peas) Deep South but this addition of idli rava is interesting ..
Harini those fried beauties are calling me! very nicely done and it will be a great side dish! Yumm, those mixed dal fritters look so crispy and addictive. They are great as snack or side dish. Good one. Wow adding idli rava to friters sound interesting! I have added raw rice a little while soaking the dals for that crunch, will try this method next time i make it!! 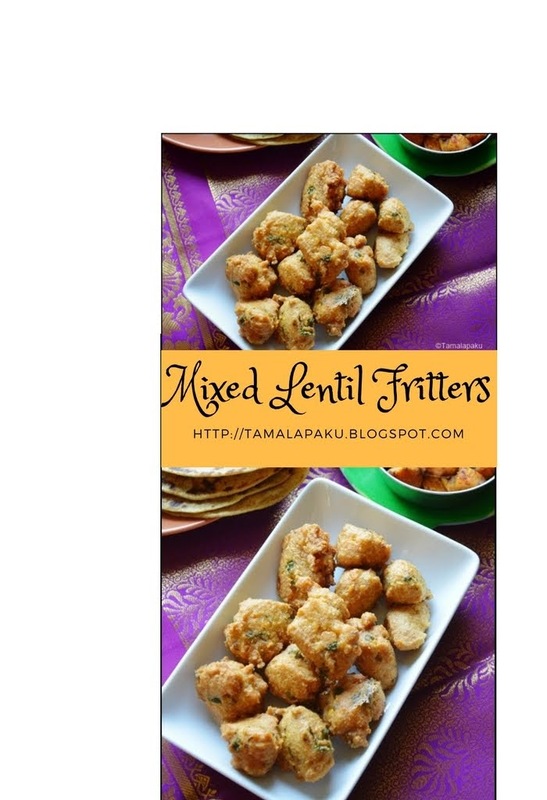 Those mixed lentil fritters sound very flavorful even without onions. A slightly watery batter would make great dosas too, I guess. Ah ! Fritters made withfreshly ground lentils and rice , wow ! They sound absolutely fantastic ! Awesome recipe . I have always used just one single lentil for these , but this one is fantastic . These are so perfect for the evening snack. My boys would love to munch on this as soon as they come back from school.